Most of my days now aren’t spent in the field chasing antelope or scouting for big game. I made a career choice last year which moved me from the mountains to the waves. Now, most of my time is spent traveling the Pacific and Caribbean interdicting narcotic smugglers or stopping sail freighters chocked full of migrants. Occasionally, I get a couple of days off in some foreign country for some much-needed rest and relaxation. This day I found myself cruising up the coast of Isla de Cozumel in a fiberglass panga. Pangas are the go to boat for everything in Latin America. They are cheap and easy to produce and can withstand some pretty rough damage before sinking which is why they are so popular with drug runners. This panga wasn’t laden with drugs and I wasn’t conducting law enforcement operations. Quite the contrary, two friends and myself had chartered this boat to spend the afternoon chasing bonefish, permit, and snapper in the lagoons of northern Cozumel. Many people see Cozumel in a different way than what we had in mind. The hop off one of the six daily cruise ships to shop, eat, and drink until that ship departs that evening. Our plans differed by the fact we were no held to a cruise ship’s schedule and wanted to chase fish, not margaritas. A short walk down the main pier put us dead center of the hustle and bustle of a magnitude of tourists taking selfies and wandering aimlessly throughout the city streets. We found ourselves overwhelmed by the sheer number of shops selling trinkets typical of every tourist city in Central America. We steered our way through the swimsuit clad tourists and found a taxi stand. Our fishing guide was booked just hours before our arrival in the wee hours of the morning. We were nervous about a confirmation of the booking so we wanted to get to the marina extra early to find our Captain and confirm the trip. Our 15 minute drive to the marina was filled with the typical sights and sounds of a bustling port city. Taxi horns and loud music rang through the streets as barkers called from local bars and tequila shops promising only the best deals. Finally we exited the city center and zipped along a coastal highway presenting a different view of high rise hotels and small apartment housing. The nervous excitement of a day on the water was building. We had no idea what we were getting into, but knew an adventure was unfolding in front of us. An unexpected sharp left turn put us in the center of an oval parking which was the entrance to the marina which looked more like a stone fortress than a boat dock. Large stones with thick mortar lines extended upward to ramparts looming high overhead. To the left was a small shop and a ramp headed down toward the docks. The masts of sailboats and pilot houses of cruisers could be seen over the tops of the ramparts. I smiled as we exited the taxi. One step closer. 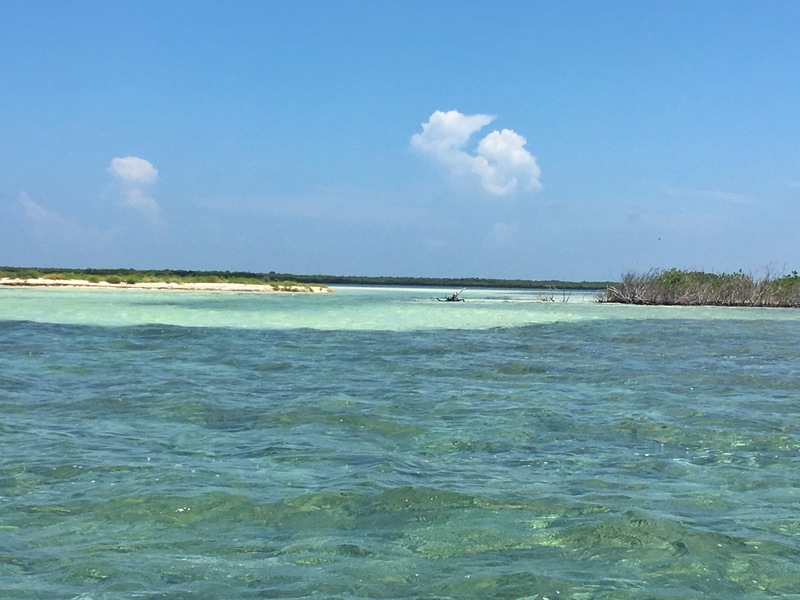 On the north end of the island was a series of lagoons mixed into the mangroves which held saltwater flats, home to the highly sought after bone fish. Unfortunately this fish, although fun and challenging to catch, was not a harvestable fish here in Cozumel. Just like anyone, I enjoy a challenge despite the fact that I couldn’t put one of these guys on my plate. We would also have the opportunity to catch permit, mangrove snapper, and barracuda which we could eat. Maybe fresh fish tacos were on the menu after all. The name of the marina was the only piece of information we had about where to go and who would be guiding us. We wandered around the marina for 10 minutes until we stumbled upon a group of guys from the large charter boats sitting around drinking beer. Through broken Spanish and a lot of hand signals it was determined that we were much too early for our trip. They told us our boats were next to the boat ramp under a footbridge which looked more like a castle gate over a moat. There below the footbridge was a line of multicolored pangas, each sporting its name and lettering identifying it as a fishing charter boat. We saw no one around and quickly decided amongst ourselves to head somewhere for lunch. We would show up on time and hope for the best. As we were walking up the stone ramp, a whistle was heard from down by the main dock. An older man in shorts and a button up fishing shirt waved us over. His name was Carlos and he would be our guide. Luckily for us Carlos spoke better broken English than our broken Spanish. 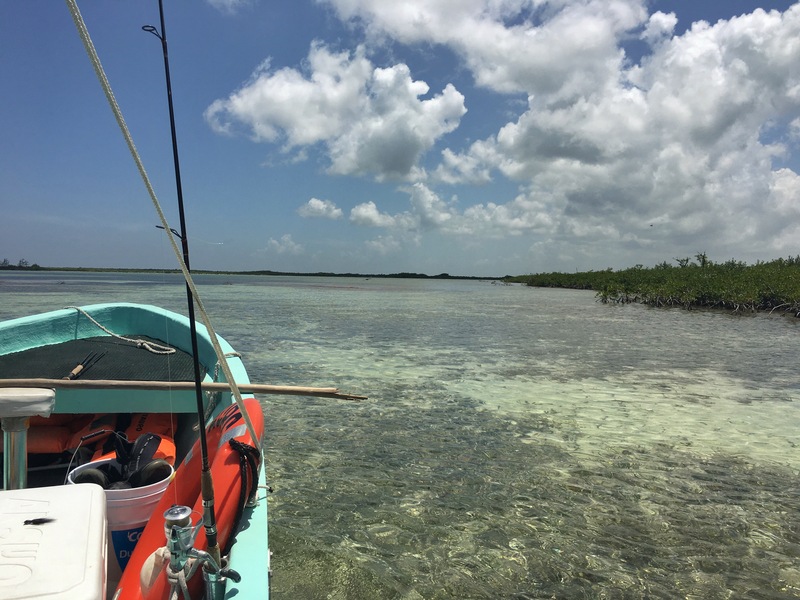 Our adventure would include a cooler of beer and water, chips, fly rods, spinning rods, and a 45 minute ride to the flats followed by a push pole trek through the saltwater flats. That conversation still left us with two hours to kill. The anticipation was killing me. Two hours passed and we returned to the marina to find Carlos and Manuel, our deck hand, waiting by our panga for the day. We passed over our bags and hopped into the boat. A quick jerk of the engine’s pull cord and a push off of the dock got us underway. We quickly exited the dock and headed for open water. Our cruise up the coast was a beautiful ride over waters which were colored multiple shades of blue and turquoise. Looking down into the crystal clear water felt as though you could reach into the water and grab the reefs below. The serenity of the ride and the fading markers of civilization reminded you that you were venturing into the wild. After 45 minutes, the panga slowed and Carlos steered towards a small cut which opened up into an expansive lagoon. Carlos and Manuel traded spots on the tiller. Carlos went to the platform on the bow of the boat and began passing directions to Manuel. We made a huge circle around the outer perimeter of the lagoon. Carlos later explained he was looking for the fins of the bonefish and areas where the water was cloudy. The bonefish are skittish and don’t like to stay long in clear water. At the completion of our perimeter cruise, we anchored at the northern end of the lagoon. Something different I noticed about our anchoring was the placement of the anchor and chain at the stern of the boat so to keep our bow clear for fishing. Carlos grabbed a fly rod and hopped on the platform. His casting was near flawless. I am always mesmerized by a person who can cast a fly really well. Back and forth like writing cursive where each stroke is timed to perfection. He cast several times with no luck and then waved me up to the platform. Mind you, I am not a avid fly fisherman and my casting skills are nowhere near Carlos’s distance or technique. I cast several times in several different directions to no avail. Time to move. The anchored pulled up and we cruised to the southern side of the lagoon where Jack would try his hand at casting a fly. The same actions again with negative results. Kyler followed with the same. No bonefish to be had. We spent the next hour moving around this lagoon in the afternoon heat just sweating and casting for fish. It was marvelous. The conclusion of that hour found us in the next lagoon where we traded our fly rods for spinning tackle. Time to target those edible fish along the edges of the mangroves. 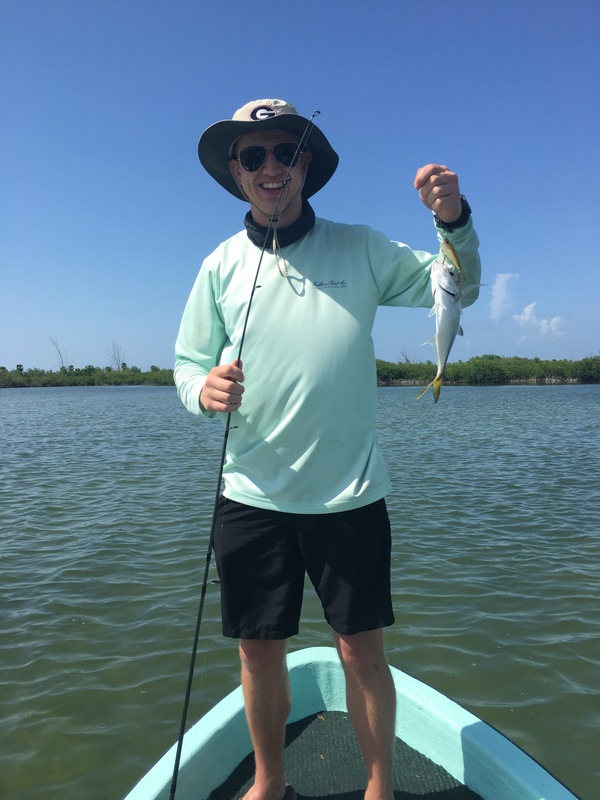 This tactic proved more beneficial when Jack quickly hooked up on a small permit. We continued to cruise the outside of the lagoons casting as Carlos and Manuel took turns pushing us forward. Each nook and bend resulted in bites from barracuda and snapper. With each cast, six or seven fish would chase our lures out of the mangroves. Everyone caught a fish or two which ended up in the cooler. The serenity lagoons was beautiful. Birds flew overhead. The wind gentle blew through the mangroves and the fish were biting. The sun was hot but the beer was cool. We fished the remainder of our two hours. We would take a break in the shade while they pushed us through the little cuts which led from lagoon to lagoon. 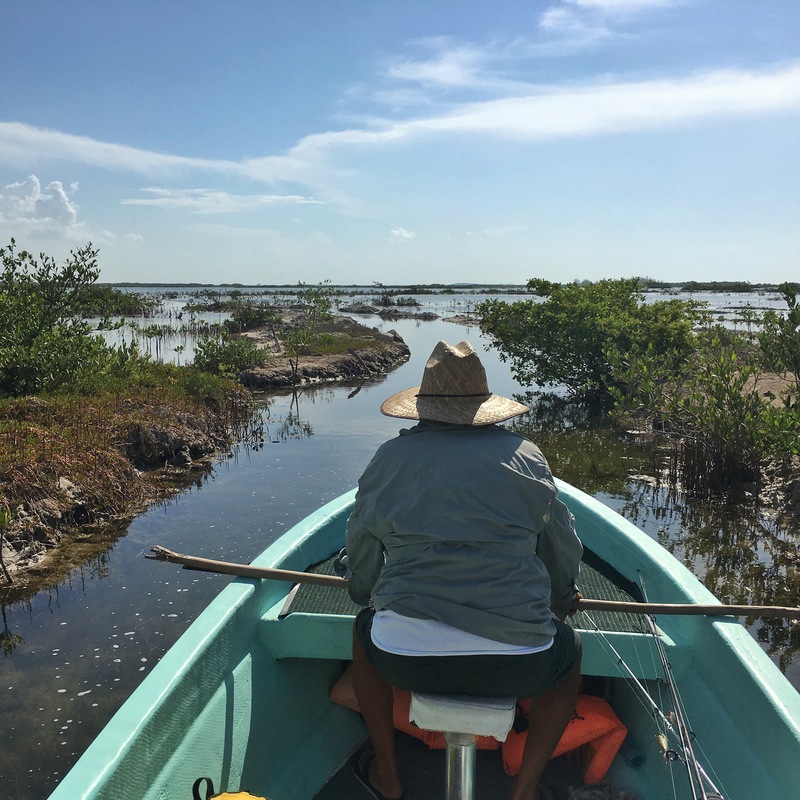 The last lagoon, a mangrove restoration project in the works almost gave us our first bonefish. Manuel was pushing us through some very shallow water when he stopped and pointed. A single fin could be seen cruising through the water. It was a lone bonefish. We rattled around in the boat too much in an attempt to grab a rod. The fish spooked and the fin could be seen jetting away. In an instance, the ghost of the flats had appeared and disappeared. In awe but not upset, we headed back to town with some fish in the cooler and smiles on our faces. 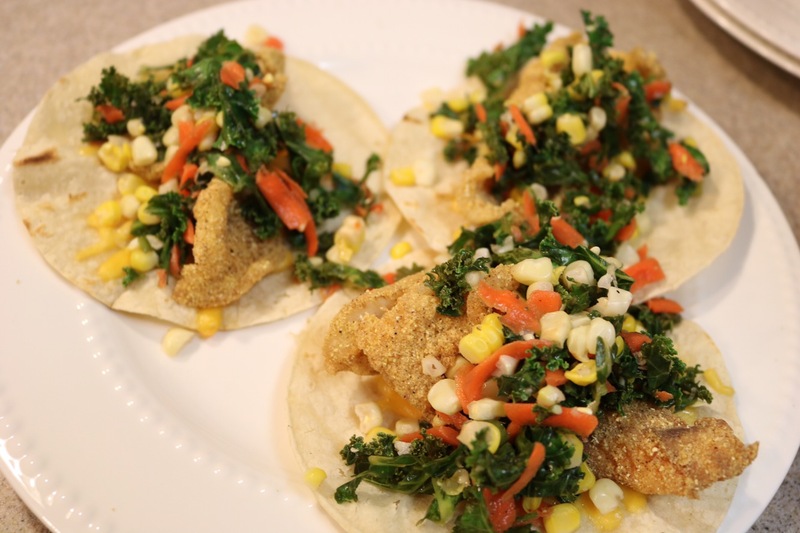 Mangrove snapper tacos was one the menu tonight and what an adventure we had!